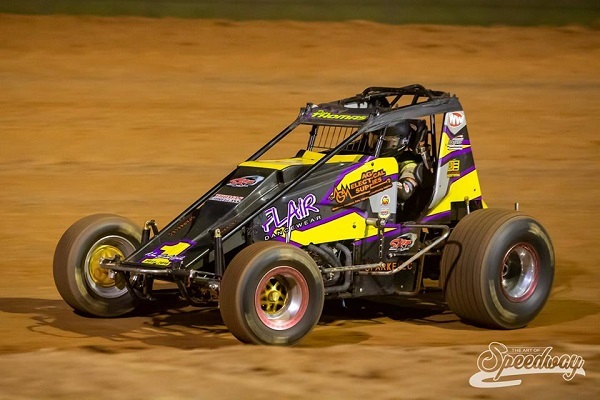 Following the initial rain out of this season’s NSW Wingless Sprint Title back in January, a massive field of drivers are now gearing up to contest the rescheduled running of the event at Sydney’s Valvoline Raceway this Saturday night. With a 58-strong line-up preparing to take to the track in search of state title glory this Saturday night, it’s anyone’s guess who will emerge victorious. However, with defending NSW Champion Dean Thomas, who is somewhat an expert when it comes to the Valvoline Raceway track, amongst the nominations, he’ll no doubt be considered one of the favourites. After scoring a pleasing fifth-place finish during the Australian Championship at Warrnambool’s Premier Speedway (Vic), being the highest-placed interstater, former NSW Champion Jason Bates, will be out to prove himself as he attempts to reclaim the crown. Looking to continue what has been a banner 2018-19 season so far, Lismore’s David Eggins will be looking to improve on last season’s NSW Title result, which saw him narrowly miss out on a top-three result, coming home in fourth, while veteran racer Mark Blyton will also hope to go one better after powering from position 10 to clinch the runner-up spot last season. Recently being dethroned in the SA Title, a mantle he’d managed to hold on to for three consecutive seasons, it’s been a tough season so far for Joel Chadwick (SA), having also missed out on achieving an Australian Championship three-peat. Chadwick certainly has what it takes to win title events and he will be aiming to return to his best this Saturday night. Representing the state of Victoria, Storer brothers Daniel and Luke will be a pair to watch throughout the event, with each of them having already achieved state title success this season, Daniel in the SA Title and Luke in the Victorian Title. However, it will take nothing short of a herculean effort to get Daniel back on track after a massive crash in last Saturday night’s Indy Race Parts Super Series round at Hamilton’s Western Speedway. While he wasn’t able to retain his Victorian Champion status this season, Travis Millar (Vic) proved that he is a genuine national contender during the Australian Championship when he narrowly missed out on a podium spot, greeting the chequered flag in fourth place. Riding a wave of confidence after emerging victorious in the recent Stonypoint 5000 event, Millar will leave nothing in the tank as he chases the number one spot. Current Australia # 2 Luke Weel (Vic) will also be in attendance. Having been in front-running form this season, Weel has been somewhat unlucky in title events, so he’ll be hoping to rectify that come Saturday night. Qualifying into the Australian Championship feature race back in February, Ashleigh Jack has certainly reached new heights this season, and she’ll be hoping to crack into the top five this season after narrowly missing out in last season’s NSW Title. While it hasn’t been the strongest season for her Aussie Racing teammate Luke Sayre, his proven consistency which saw him place second in last season’s NSW Club Championship point standings, will hopefully be in play this Saturday night. Flying the flag solo for Queensland, youngster Cody O’Connell displayed blistering pace during the Australian Championship, which he’ll surely be hoping to repeat throughout the NSW Title to steal the crown and do his state proud. Also looking for a positive result will be local driver Kyle Mock, along with Marshall Blyton, Jack Gray, Parker Eveleigh, Jeff Thomas (Dean’s older brother) and a host of other contenders, who will all be vying for the NSW Title crown. The NSW Title format will see drivers contest two rounds of 10-lap heat races, a 15-lap B main and the 25-lap NSW Title-deciding feature race.